Preparing a home to sell means decluttering the rooms in your home. Proper organization and cleanliness will make the best impression on your buyer when they visit your home. This means taking extra special attention in the kitchen where many times most of the clutter exists. 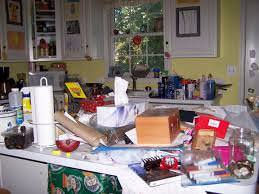 Take a look at your kitchen counters, do you have unneeded items there? Make sure to clear all your kitchen counters. Yes, even the toaster and mixer should be clear. If you don’t have the space in your kitchen cabinets then maybe it’s time to do some spring cleaning on the items in your cabinets. Do you really need all the Tupperware container tops that don’t have the matching containers anymore? Clear them out and throw some stuff away or better yet donate them. If you absolutely must keep some items then sift through the items you don’t use on a regular basis and put them in a box, seal it up tight and put it in storage or the attic for safe keeping. When buyers look at your home for sale they’ll open drawers and cabinets especially while in the kitchen. As a seller you always want to present the best and most clean impression to the buyer as they wonder through your home. Make sure your cabinets and drawers are not jammed packed with items you could do without. As a buyer walks through the home they will be looking for places to put their stuff and when they open a closet, drawer or cabinet and it’s over-flowing with your personal items they will never be able to envision their own belongings in your home. As a seller you want to make as much empty space as possible so the perception is that the home has plenty of storage. What about our junk drawer? Of course everyone has one of those drawers and it seems to be the catch-all for anything that doesn’t meet an immediate specific need. If your drawer is like mine it has batteries, tape, paperclips, spare change, etc in it and definitely could be cleared out. Get rid of your junk drawer, go through it and organize it with a drawer organizer. If there are items that you need to keep and it doesn’t go somewhere else then box it up and store it. On to the pantry and canned foods, some people have a couple items for next weeks dinner and that is just fine. If you are a prepper though and have 60 years worth of food stored in your pantry then you’ll need to address that. Again, keep what you need for the next week or so and store everything else. Yes, you may double buy some items but if a $1.00 can of peas stands between you and selling your home you’ll likely agree you could do without the peas. One final thought is below the sink. Make sure to clean and organize it, many buyers will open the cabinets under the sink to look for storage and to see if there was any recent leaks. Organize the space, get rid of empty boxes and cleaning supplies and combine things. Lastly, once you have the space under the sink in a “only need these items” fashion, clean the area well. Scrub it so that the under the sink area smells fresh and clean. If you have any questions on our topic of Preparing a Home to Sell Means Decluttering then please feel free to contact us. Additionally, please feel free to post a comment below.